Sometimes, conflicts can be negotiated during the group meeting, but often it is difficult to solve an issue with the whole class chiming in. Additionally, many conflicts are potentially too volatile to negotiate in that setting. Evaluating the effectiveness of a TPSR program is no simple task. After-school and community-based programs often serve small numbers of students and have high turnover rates. In fact, the more committed program leaders are to working with underserved youth, the less likely they are to have a program that lends itself to a “clean” evaluation. However, process-oriented evaluations conducted by TPSR program leaders themselves are common and often quite valuable. 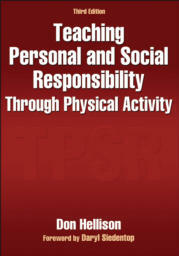 This edition of Teaching Personal and Social Responsibility Through Physical Activity presents proven ideas for teaching personal and social responsibility in school and other settings. It also supplies direction to professionals in teaching affective and social moral goals, an in-depth look into teaching character development and values, and a method for helping students develop personal and social responsibility.